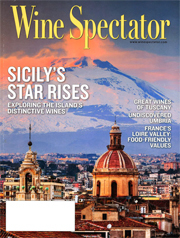 The Ca’ Marcanda Bolgheri Camarcanda 2010 is one of Tuscany’s “top wines,” writes Bruce Sanderson in the October 2014 issue of Wine Spectator. Sanderson includes the wine in his list of “top wines from Tuscany,” awarding it 95 points. It’s “the best Camarcanda to date from vines that are now 13 years old,” he notes, calling the estate a “quality leader” in Bolgheri.